2018 Leaf Metal Sports Heroes is a multi-sport release. The set features athletes from a variety of sports. In addition to the big four (baseball, basketball, football, and hockey), athletes from boxing, cycling, soccer, wrestling, MMA, and the Olympics are featured. There are plenty of parallels to keep player collectors busy. Every card is serial numbered to 20 or less. The serial numbering isn't consistent among players. For example, a blue parallel featuring one athlete may have a different serial number than a blue parallel featuring another athlete. 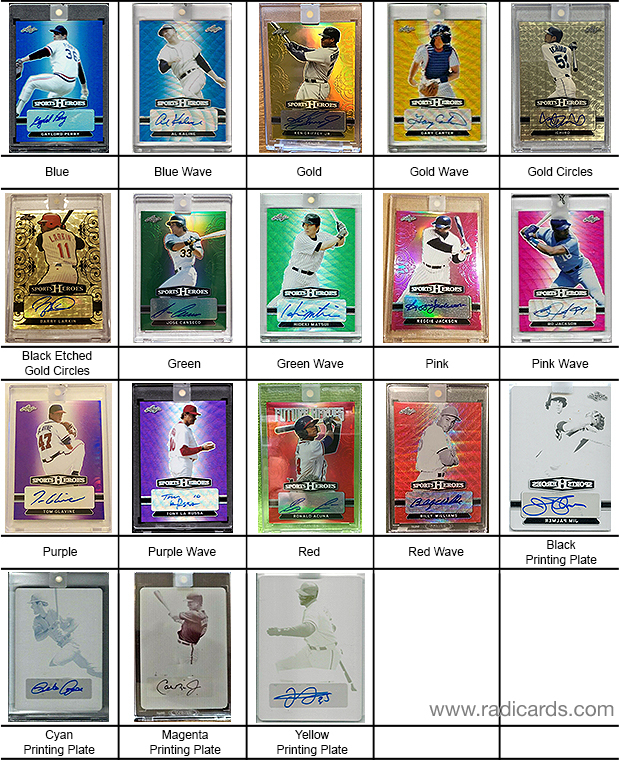 Depicted are examples of the various parallels that can be found for any one card in the base set. In addition to the base cards, this release features the following insert sets: Class of '18, Future Heroes, Goooal!, Kings of the Ring, Medal Heroes, Nicknames, and Dual Autographs. All cards are autographed and come in One-Touch Magnetics with Leaf seals.